I’ve been reading Our Nige’s blog, Steppin’ Out, with great interest and a certain amount of nostalgia. He picked up his new floating home last Sunday and over the last week has been learning all about the boat as he cruised towards Mercia marina. He reminded me of my first cruise down the south Oxford and onto the Thames. 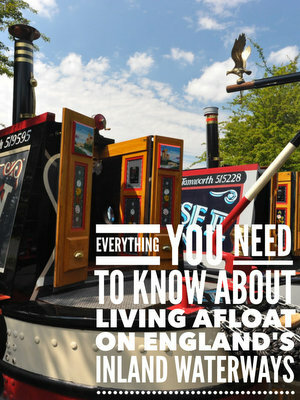 I had only been working at Calcutt Boats, was still living on dry land, and didn’t know much about narrowboats at all. I was given the job of transporting one of our new clippers, a Calcutt Boats built 50′ cruiser stern narrowboat, to the IWA National Festival at Beale Park on the Thames. To say that I was under prepared for the cruise was an understatement. I took my then twelve year old son, Brook, with me to help with the locks, lift and swing bridges and coffee making duties. I loved every minute of the adventure, and what an adventure it was! We set off early in the morning on the first day, passed through Calcutt Top Lock from where the clipper had been moored on the wharf, stopped briefly to eject the stowaway site cat that had sneaked on board at some stage and very nervously cruised along a tranquil waterway before coming to our first narrow lock on the south Oxford at Napton. This was the second time in my life that I had operated a lock (The first had been at Calcutt half an hour earlier). I enthusiastically raised the paddle to let the water out of the lock. Too enthusiastically as it happened as I hadn’t secured the clipper to the bollard correctly and, before I noticed anything wrong, the boat had drifted away from the bank and down the canal taking a very confused twelve year old with it. A couple on a boat moored close to the lock brought both boat and son back to me with a smile and a laugh. It was a very wet August. By mid morning I was so wet and cold that I could hardly think. Of course, I hadn’t brought any waterproofs with me. I had to stop the boat for two hours so that I could light the fire and warm up. As feeling returned to my extremities I looked out of the window as I dressed for the next leg of the journey… to find that one of the mooring stakes had pulled free from the soft earth and I was broadside across the canal. Another lesson learned. Over the next four days the adventure continued; we were pinned to the bank by the wind in Banbury, had to extract ourselves from a reed bed when I tried to get out of the path of a working boat and butty, had to stop for four hours while the police pulled a body out of the canal, and had the joy of trying to negotiate a lift bridge that was too heavy for Brook to raise on his own. We moored in some idyllic spots away from the noise and the stress of the “civilised” world. 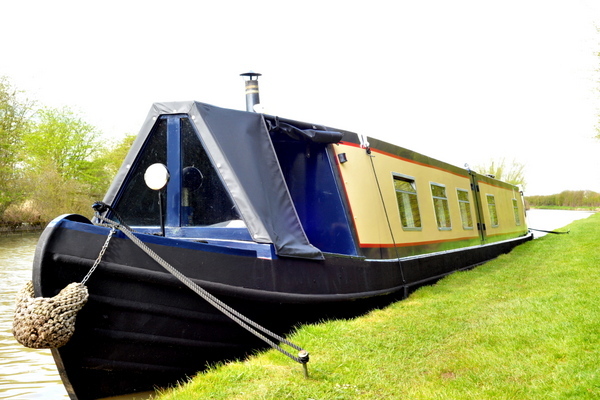 It was my first experience of the peace and quiet of rural canal moorings and I loved it. And then I joined the Thames. What a shock! After 49 miles of gently winding canal I nosed out onto the scary and oh-so-wide Thames at Isis lock junction. Although I had become reasonably proficient over the preceding three days on the canal, the river was a different kettle of fish. I immediately headed for the very large and very clear signs warning me to keep clear of the weir and was instantly pinned against the safety barrier put there to prevent idiots like me from being swept over it. I was pulled free, helped into a lock large enough to take a dozen boats and prevented from going any further down the Thames until my “trade plate” license was checked. Eventually I was allowed through the lock. The remaining 30 miles downstream to Beale Park was exhilarating With the current helping me, I cruised at more than twice the speed I had on the canal and I had so much more space to play on than I had on the Oxford. We eventually found a bank side mooring on the Thames for our last night. We tried and failed four or five times because of the shallow water next to the bank. The cruise only lasted four days but we covered eighty miles, forty canal locks, ten river locks and eighteen swing or lift bridges. The first three days were ten or eleven hour cruises; the last day was a rather tiring thirteen hour stretch. The last hour and a half of the final full day was spent looking for a suitable mooring on the gently shelving Thames riverbank. It was a great adventure. I loved every minute of it. I can’t wait for regular cruises in the future. After I wrote the above introduction I realised that, although I can’t afford the time off work to enjoy a multi day cruise at the moment, there’s nothing stopping us from going out for the day now and then. My home mooring Calcutt Boat’s stunning Meadows marina is the perfect starting point for many different routes. If I turn left out of our marina, I’m on the Grand Union heading west to Leamington Spa and Warwick and then on to Birmingham. If I turn right, go through the Calcutt flight and cruise half a mile to Napton Junction, I can turn left to Braunston or right to head south on the Oxford canal towards Oxford and the Thames. I decided to take James out for a day and a night to see how the engine fared after its recent overhaul. Here’s my trip. Talking of new additions to the site, about a month ago I offered any site user their own blog section on the site so that they can create a lasting memory of their own boating experience. One or two have already taken me up on the offer. I would like to introduce you to one of them, Our Nige as he is on the forum. Nige’s dream was to own and live on a narrowboat. Even though he wasn’t sure he was doing the right thing, he bought his boat and he’s now on day seven or eight of his maiden voyage back to his home mooring at Mercia marina. If you’re thinking about buying a narrowboat, even if you’re only going to use it for recreational cruising, I’m sure you’ll enjoy the detail in his blog posts, and his determination to try every different drop of local beer at the end of a day’s cruise. Here’s the first of Nige’s blog posts. You can follow the blog’s progress through the forum here. If you’re in the process of seriously moving to a life afloat and you would like your own blog please read this post and then get in touch with me. I can have you up and running in about ten minutes.